“It’s true, Ronaldo was disappointed not to receive the best player award,” Allegri said. 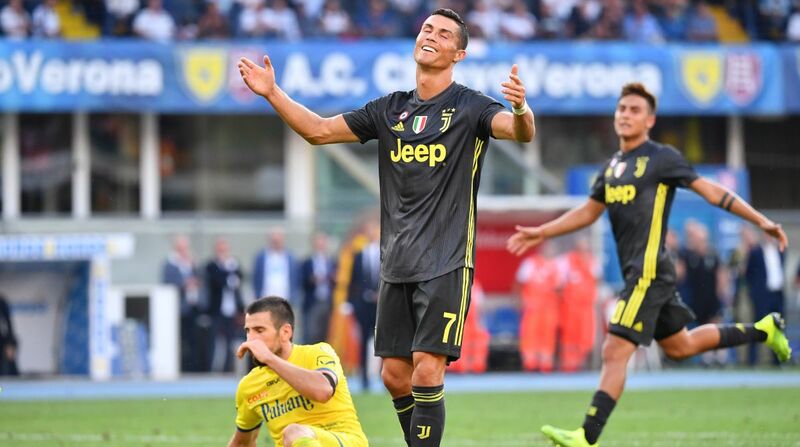 “He scored 15 goals in the Champions League and won the cup.” Ronaldo left Madrid in the offseason in a Serie A-record 112 million euro (then 132 million) transfer, but he is still figuring out how to score in a league known for its defensive qualities. “He won’t get more than 30 goals, in my view,” Ferrara told Il Corriere di Torino. “It’s different in Italy and I’m not saying that just because of the defenders we have here, but also the style of football. It’s more tactical and even the smaller teams are more organized.” Ronaldo scored 26 goals in 27 Spanish league appearances last season. He also didn’t score in his first three Liga matches a year ago, though he did score in other competitions for Madrid during that spell. Can Gonzalo Higuain and Patrick Cutrone co-exist at AC Milan? If the final minutes of Milan’s 2-1 win over Roma were any indication, the answer is yes. Cutrone came off the bench and was set up by Higuain for the winner five minutes into stoppage time. However, Milan coach Gennaro Gattuso has hinted he believes using two No. 9s together from the start would leave his squad unbalanced. “If you play with two lines of four (in a 4-4-2) it might not work,” Gattuso said. “But Patrick, who hasn’t had much space lately, is a player with poison in his veins. There will be time and space for him, too. The 20-year-old Cutrone scored 18 goals in all competitions for Milan last season but has become second choice to Higuain, who Milan signed from Juventus. It seemed like yesteryear at the San Siro with Paolo Maldini, Leonardo, Kaka and even Adriano Galliani in the tribune. Since U.S.-based hedge fund Elliott Management took control of Milan last month, the club has brought back several stars from the Rossoneri’s golden years. Leonardo is Milan’s new sports director, Maldini is the sporting strategy and development director and Kaka is also being linked with a Milan job. Galliani was Milan’s longtime vice president under the presidency of Silvio Berlusconi. Krzysztof Piatek has already scored seven goals in all competitions for Genoa this season. Piatek scored a brace in a 5-3 loss at Sassuolo on Sunday, giving him three Serie A goals to go with his four in the Italian Cup. The 23-year-old striker was called up to Poland’s team that will face Italy in the Nations League on Friday.